Wanting Exterior Painting in Chattanooga? 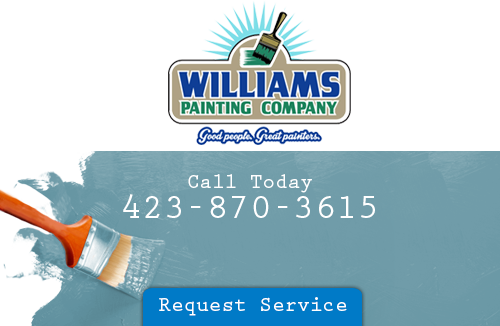 When it comes to the exterior of your home, the only thing that’s going to help bring it back to life is a Chattanooga exterior painting from Williams Painting Company. We were founded back in 1989 and have over 20 years of experience. Our exterior painting service is top-notch. We’ll get the exterior of your home to where you want it to be. The outside of your home deserves to look just as good as your interior. Call to get your free estimate. You’ll never have to settle for that dull, boring look ever again. We only hire experts who know how to paint exteriors and won’t break the bank going for the look that you want. A lot of times our clients ask if it’s at all possible to use a cheaper exterior paint in order to save a few dollars. We tell them that they can, but it’s going to cost you a lot more in the long run. The money you spend today will be the money that you end up saving tomorrow. We use quality exterior paints. The paint that we use provides a great look, for the outside of your home, and will last a whole lot longer than cheap exterior paint does. Some of the other characteristics of the exterior paint that we use are -has better color retention. Chattanooga exterior painting keeps the new look of your home almost twice as longer than inexpensive paint would. Superior paints don’t tend to pick up airborne dirt and impurities. The outside of your home will remain clean. When you use better paint, the less coats you’ll need. Good paint sticks with the first coat. That’s what makes exterior paints so different. You’ll be able to hide blemishes with quality exterior paint. This will save you more time and money on supplies and labor costs. Go with the exterior painting services of Williams Painting Company and the less your paint is going to flake. Only good exterior paints prevent flaking from occurring. Of course the paint on the outside of your home will start to peel over time, but good quality paint will prolong the process. If mildew disgusts you, then when making the decision to have the outside of your home painted go with a better exterior paint. We can’t stress enough just how much better this paint is going to hold up. Your chances of mildew build-up will be less. You have the options to go with whatever type of exterior paint you want, but we do recommend that you go with the better quality ones as they will help in the preservation of your home. When you want the best in Chattanooga exterior painting, then contact us.